Spotted wintergreen (Chimaphila maculata) is a creeping evergreen shrub of dry woodlands of eastern North America. It’s easily identified by its conspicuous, whitish-veined, dark green, pointed leaves that are about one to three inches long and grow on stems about three to nine inches tall. Spotted wintergreen blooms in summer with white or pinkish flowers atop tall stalks. Dry, roundish seed capsules mature by October and may persist through winter. The genus name, Chimaphila, means “loves winter”, which seems appropriate for this little evergreen. The species name, maculata, means “spotted”. It’s a mystery how the species name arose, because the plant has no spots. In fact, the whitish veins on the leaves look like stripes, so another common name for the plant is striped wintergreen. Adding to the confusion, the plant also sometimes is called spotted or striped pipsissewa because it looks similar to its relative, pipsissewa (Chimaphila umbellata). Pipsissewa has solid green leaves that are more rounded than those of spotted wintergreen. The two grow in similar habitats, but pipsissewa is far less common. This painting was done using mostly M Graham transparent watercolors on Saunders Waterford 200 lb cold press watercolor paper. 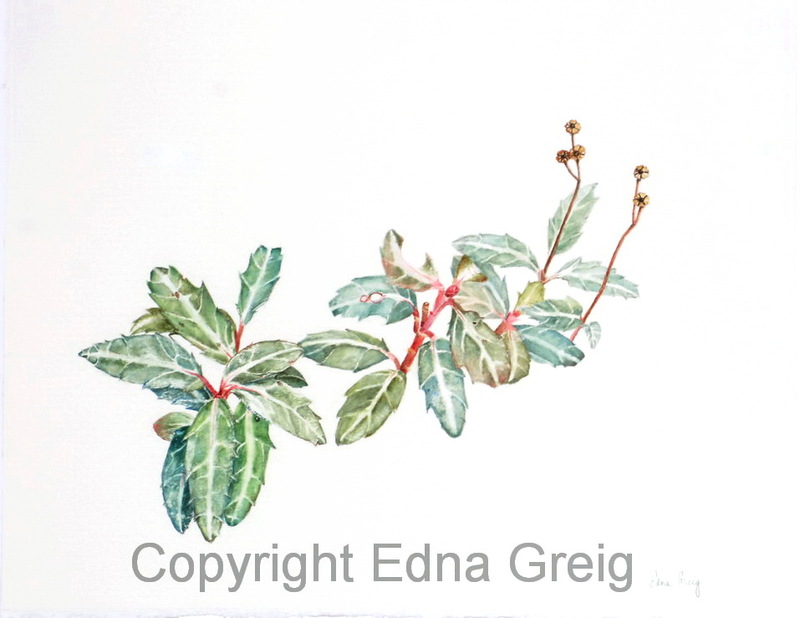 Saunders Waterford is an excellent quality paper but I find that standard white (as opposed to their “high white”) is too cream colored for many botanical subjects. 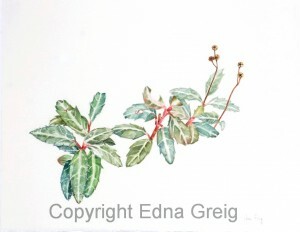 I also prefer hot press over cold press paper to achieve the finer detail of nature and botanical art.